Homeowners often first become aware of termite infestation due to the presence of flying termites. Size: Depending on the species, flying termites can range in size from 1/4 to 3/8 of an inch. Color: While worker termites are usually light in color, flying termites may be light in color, dark brown or black based on the species. The darker color helps termites retain moisture and makes it possible for them to leave the nest. How Did I Get Flying Termites? Also known as alates or reproductive stage termites, flying male and female alates emerge from existing colonies to mate and form new nests elsewhere. A flying termite swarm near the home nest could indicate a large colony in the yard or some other nearby location. Residents who find multiple alates inside, notice their shed wings around doors and windows, or see them emerging from the house exterior may have an active infestation inside their home. How Serious Are Flying Termites? Termites are among the most damaging insects found in homes. Colonies take about three to six years to mature to the point when the colony produces alates. During this time and as long as the colony is active, the termite workers feeding on wood may create costly damage to buildings. These worker stage termites eat the soft interior portions of wooden supports and other wooden building components, while leaving the wood’s outer shell intact. Termite infestations can go on for years until the damage reveals itself through evidence of mud tubes, cracks or collapse of the building’s wood. 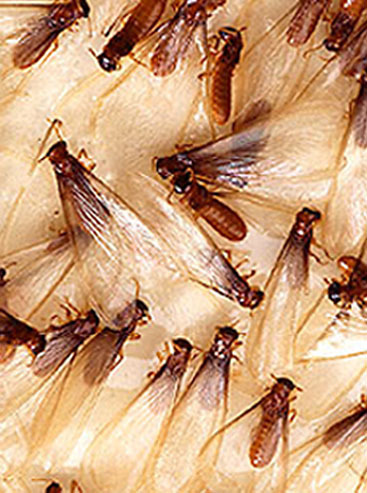 Flying termite swarms are a serious warning sign of potential damage for homeowners. We’ll determine whether you actually have termites, then discuss a treatment plan including financing that works for you. A winged termite may be the king or queen of a colony - or a swarmer (alate) launched to create a new colony. Flying termites have poor eyes, whereas worker, soldier and secondary reproductive termites are blind. Flying termites are visible when their colony swarms. Swarms are provoked by heavy rainfall and warm, humid temperatures among other triggers. 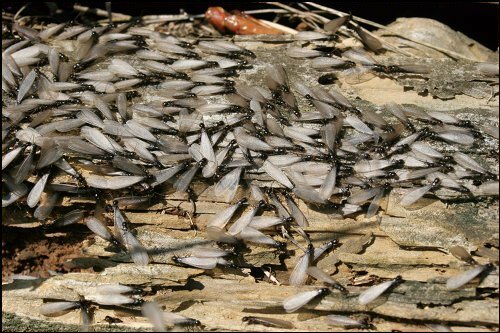 Swarms occur when established colonies produce winged male and female termites in order to reproduce. After these mating flights, fertilized termites shed their wings and go on to establish new colonies. Termites seen flying in a home are indicative of a mature colony. Homeowners should contact their local professional pest control expert to learn about extermination solutions for their home. While flying termites closely resemble winged ants, there are clear differences in their appearance. Ants have a constricted waist, while termites have a more straight-sided waist. Termites also have four wings of equal size. Ant antennae bend at 90-degree angles, while the antennae of the termite are straight.